As more states legalize marijuana, we’re starting to get a better of understanding of what drives prices. Two of the biggest factors? Supply and regulations. Cannabis research firm Headset studied four different marijuana markets – California, Colorado, Nevada and Washington. And it found Washington to be the cheapest, with an average price of $15.33 across all products. 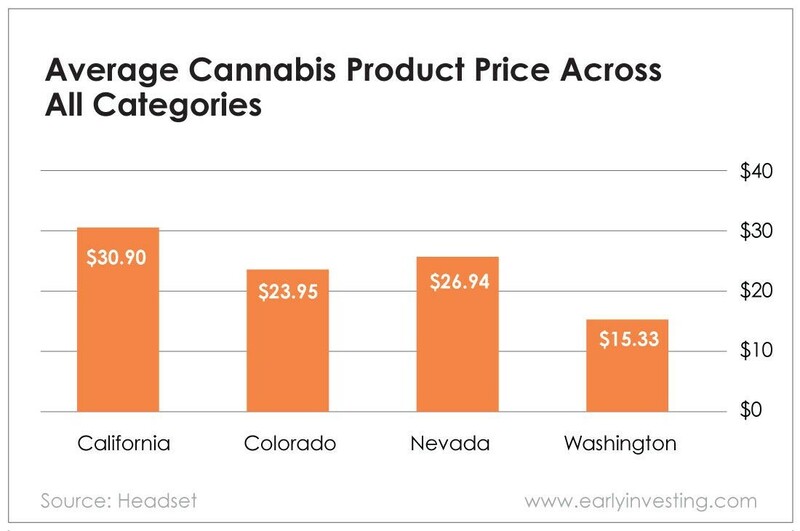 Colorado comes next ($23.95), followed by Nevada ($26.94) and California ($30.90). The report found a correlation between low prices and how long recreational marijuana has been legal. Washington and Colorado legalized it in 2012, Nevada in 2017, and California in 2018. All of this makes sense. Prices tend to fall as supply rises. Washington’s low prices are a direct result of oversupply and competition. The state’s October 2017 outdoor harvest was its largest to date, bringing the market a 60% larger supply than 2016. Steve Fuhr, a Washington marijuana grower, told Marijuana Business Daily he has three times more product than retail sales. “It’s a bloodbath of prices,” he said. Washington also has thousands of retail brands that help drive down the prices of marijuana products. Meanwhile, Colorado’s marijuana operations are more vertically integrated, which keeps prices a little higher. But the real price killer is regulations. California has so much more red tape that the state has been extremely slow to grant annual grow licenses – approving just 56 out of 6,900 applications. And as many as 10,000 growers may see their temporary licenses expire in the coming months. Burdensome compliance costs don’t help either. But even with looming supply problems, Headset doesn’t think California’s pot prices will continue to remain this high. Even with the state’s high average item price, Headset notes that California has the cheapest edibles of the four states it researched. As more states legalize marijuana, we’ll see if prices will continue to vary from state to state or normalize across the country. We’ll also discover just how big the market is for the $1 million bong.